Yeager Airport also known as Charleston WV or CRW, is a public airport, situated just east of downtown Charleston, in Kanawha County, West Virginia, United States of America. Airport handles about 450 thousand passengers annually, together with 800 cargo transportation operations, making it up to more than 40 thousand flight operations in total. The FAA categorized CRW as a non-hub primary commercial service facility. The airport hosts McLaughlin Air National Guard Base. Main terminal includes three concourses. Concourse A includes 7 Gates that are used by Delta and United Airlines and is located to the left of Concourse B. Concourse B has 2 gates and is used by Delta and Spirit Airlines, additionally including gift shops, cafe, restaurant and most importantly – secure area, that all passengers must exit through. Concourse C has 5 Gates that are used for American Airline flights, it is located to the right of the Concourse B. The pre-security area lobby invites you to the Tudors Biscuit World and Gino’s Pizza & Spaghetti House, while post-security area offers Kanawha Café, gift shop, shoe shine service, game room, free Wi-Fi and charging stations. Charleston airport long term parking includes two covered parking garages, together with short-term parking lot, just a few minutes walk away from the main terminal. Yeager Airport Parking garages offer four- and five-storey buildings of covered parking spaces for their customers. The 20 Minute Drop Off/Pick Up lot is located right across the terminal, this is the closest and most convenient spot for parking. The outdoor short-term parking lot is situated right next to the 20 minute lot, and is also very comfortable to access from the terminal. All the parking places are open 24/7. There is no shuttle bus between the parking lots as their layout is very close and easy to reach from the terminal. Charleston WV airport parking fees are listed below. Short-Term CRW airport parking is free for the first 7 minutes, then rates $1 for the first hour and $2 for each additional hour up to daily maximum of $10. Long-Term Charleston airport parking costs $4 for the first 2 hours, $5 for 2-6 hours, $5 for 6-10 hours and up to daily maximum of $9 per day. 20 Minute Drop Off/Pick Up lot is free for 20 minutes. 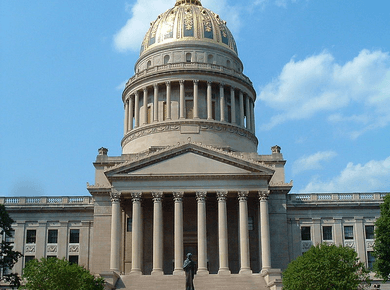 Charleston is the capital city of West Virginia, with over 300,000 citizens. This is a popular tourism place to visit, holding numerous of sports, recreational, and cultural events. But the best part is the West Virginias mountains, snowboarding, tubing and skiing. Enjoy your stay at off-airport hotels with free parking, great views and convenient shuttle bus service to and from the airport. Using Charleston airport parking coupons may decrease parking rates even further. Charleston Marriott Town Center, Embassy Suites, Four Points by Sheraton, Holiday Inn Express Civic Center, Best Western, Fairfield Inn by Marriot and many more are ready to open their doors and welcome new customers.